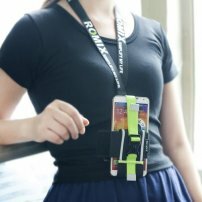 ROMIX Universal Running Sports Armband Strap for iPhone / Galaxy S7 / Smart Phones [POD005193] : Onchee.com - the accessory shop for all your handheld Electronics! This is a sport band that you can armband, it comes with a landyard that you can use with your bag, hanging your smartphone to your chest. What's more? it holds upto 2 Smartphones! - A Sport band that is for up to 2 devices! - Case Compatibility: It is degisn to have enough elasticity that makes it possible to fit smartphones even equipped an Otterbox Case or other Tri-proof (shockproof, waterproof and dustproof) protective cases directly. - With reflective straps can widely enhance the visibility and protect your safety in low light conditions. - Adjustable to fit different sizes of cell phones ,which is not limited to only carrying mobile phones but also MP3 players such as iPod Classic or any portable device. - This is a universal sport band, not a dedicated to any model, we can just guarantee it is physically fit to your device. some ports or buttons may be not accessible.